Photograph of Tom Johnson's Boarding House, 1885 in Copper Cliff (City of Greater Sudbury Heritage Museums Collection) Tom Johnson is wearing an apron in the doorway. The Copper Cliff Museum now occupies the site of the first dwelling built in Copper Cliff, which was Thomas Johnson's Boarding House. 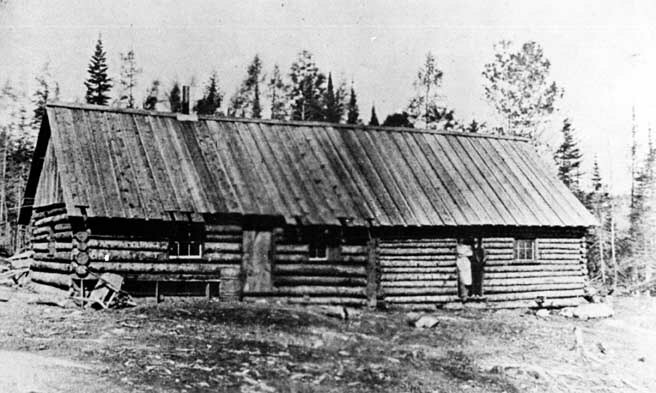 The log building was built by the Canadian Copper Company in 1885, but was not occupied until August of 1886 when Mr. and Mrs. Tom Johnson and their daughter, Margaret, arrived from Bay City, Michigan, to operate the boarding house. Tom Johnson and his wife had five children. The first customers at the boarding house were eleven miners hired for the development of the Copper Cliff No. 1 Mine property in 1886. Romance blossomed swiftly in the new camp. Margaret Johnson was married that same year to Moses Austin, the Copper Company's teamster [driver of a team of horses doing hauling], and they took up housekeeping in a little cabin near the boarding house. In 1887 their daughter Maud Austin was the first baby to be born in Copper Cliff. Pete Martel, son of Joe Martel, was a toddler of two when the family came to Copper Cliff lo live. For a time they lived in the Johnson boarding house. In the early days, his dad played the fiddle for dances held at the Johnson boarding house, Dan McKinnon's boarding house at the smelter and Tom Smiles' boarding house at Evans Mine. His dad, Joe, was an expert stonemason, and he worked on the masonry of the general office [Pat's Barber Shop]. The Canadian Copper Company staff moved from a cramped frame building on the site of the Copper Cliff Hospital [Walford Residence] to the General Office in 1902. From the 1891 Census of McKim Township, Joseph Martel, age 34, born in Rimouski, Quebec, Mine Labourer, his wife Delvina [Collin], age 35, born in Quebec and their children Joseph, age 16, Marie, age 15, Charles, age 12, Peter William, age 8, Philllipeau Louis, age 6, all born in Quebec and Nazer, age 4, Fredrick, age 2 and Ernest Joseph, age 2 months, all born in Ontario. From the 1901 Census of McKim Township, Joe Sr. Martell, age, 46, Mason, his wife, Dalina, age 45, son Charles, age 25, Smelter, Annie, age 21, Pare, age 17, Mine Labourer, Philip, age 15, Mine Labourer, Nazor, age 13, Rock House, Alfred Joseph, age 10, Ernest Joseph, age 8 and Justine Marie, age 5. By 1888 Tom Johnson and his wife had moved into a new boarding house, now known as the Milne house on Serpentine Street. Duncan McDonald and his family were the subsequent occupants of the first dwelling. The Johnson boarding house was demolished in the 1890's to be replaced by a Chinese laundry. From the 1911 Census of 240 Balsam Street, Copper Cliff, McKim Township, Joe Lee, age 24, born in China, immigrated in 1904, Laundryman, Joe Lee, age 40, born in China, immigrated in 1896, Boarder. By 1927 the address was 41 Balsam Street. The Chinese laundry was destroyed by fire in April of 1927.